Just the usual Campy quality. Only snag is my, ahem, 40 year old chain tool doesn't work with this so I needed to order a new one. Looking forward to the smooth Campy shifting in my (very) hilly terrain. Bought as a spare but usual Campy quality. Third chain in 7 years and 10k miles. Not bad. After using Sedis/SRAM chains on my Campag bikes for years I've recently found out what I've been missing. 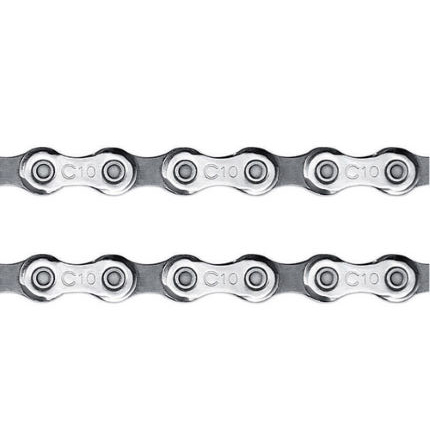 This chain shifts better and runs quieter and it's not even expensive. I use a Campag specific KMC missing link to avoid the pricey tools as well. For the money a durable, reliable chain at an economic price. Good smooth chain, even though it is at the lower end of the range. Easy to remove links and then to join. Instructions good. Great product, I think the best, the price is right. Working great! Campagnolo makes the best. Campy quality and a great price. Well worth it if you have a Campy drive train, and even if you don't! These chains just last and are very strong. The Veloce chain does exactly what is says on the tin. Its durable, light and above all is appealing to look at. Ideal for everything from your top racing machine to a winter hack, money well worth spent, and a competitive price through Merlin! Great quality chain, easy to fit and well packaged with clear instructions if you feel the need. Works well with other veloce components. In my experience, better than the standard alternative from KMC. Haven't tried their more expensive chains, though.